You are ‘running scared’ for being the next one disrupted, or belong to the others who explore the opportunities of how to become the next Netflix or Airbnb. ‘Disruptive innovation’ is worldwide discussed by senior management, professionals and entrepreneurs, and the term continues to grow in popularity due the impact on industries, businesses and our daily lives (Chafkin & Newcomer, 2016; Sujata, et al., 2015). Its definition was first introduced by Clayton Christensen in 1997 (Christensen & Raynor). Its meaning originated from the ‘hard-disk’ industry and was initially used for describing a type of technology (Christensen C. M., The Innovator's Dilemma, 1997). Nowadays, many products, services and business models are considered to be disruptive (Yu & Hang, A Reflective Review of Disruptive Innovation Theory, 2010). Its meaning scares, due its ‘surprise factor’; disruptive innovations could exist for long and not be noticed, until they start overtaking your business rapidly (Christensen, Raynor, & McDonald, What Is Disruptive Innovation, 2015). Therefore, disruptive innovations gained huge interest from students and professors as well. They attempt to discover its actual meaning and find ways to respond, in order to prevent existing businesses from being overtaken unexpectedly. However, in a recent article from Christensen (2015) it is argued that theories on response strategies do exist, but are often generic and remain elusive. Existing strategies mostly relate to a generic perspective, such as its type; product, service or business model. Markides et al. (2003) developed a model which tends to explain how companies respond to strategic disruptive innovations; business models. Their theory explains how response strategies depend on a companies’ ‘ability’ and ‘motivation’ to respond. Fewer knowledge is gained on response strategies for particular industries. Especially within the service sector, even though it is considered the most dominant economic sector worldwide World bank (2014). Due its economic relevance, staffing and recruitment agencies are chosen for this study. The recruitment industry faces disruptive innovations increasingly and is expected to face huge impact from it (Deloitte, 2012). 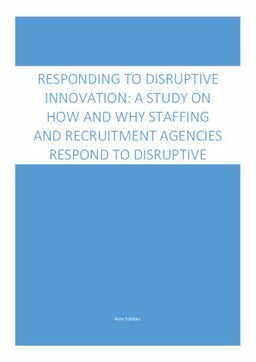 Therefore, this study develops theory, based on Markides model (2003), on how and why established staffing and recruitment agencies can respond to disruptors in their industry. It is found that the suggested moderator ‘motivation’ (Charitou & Markides, 2003) should be replaced by market ‘awareness’ in order to predict response strategies based on a company’s ‘ability’. Also, it was discovered that ‘company size’ influences the adoption and embracement of innovations. Large companies adopt innovations more often. Further research is advised with the suggested conceptual- and alternative model, to validate its generalizability and applicability outside of staffing and recruitment agencies. Thesis Advisor Jaspers, F., Olie, R.